The replica of a humidor of habanos Hoyo de Monterrey attracts the attention of collectionists and smokers throughout the world, with the exclusive of marketing only 350 pieces. A communiqué of the Habanos S.A. International Corporation, adds that novelty will be available for its sale the world over, with the particular interest from the aficionados to the hand-rolled cigars of this archipelago. 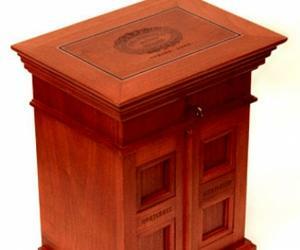 Humidors are manufactured in cedarwood, beautifully decorated that allow to conserve cigars in an optimum environment, maintaining adequate temperature and relative humidity. This type of humidor is available in the Casa del Habano chain with over 140 outlets the world over, promoting this country's tobacco culture, together with products like coffee and rum. The 50 Monterreys contained in each humidor have long cover leaves from the region of Vuelta Abajo, in the western province of Pinar del Rio, the most famous for this crop. Experts consider the Maravillas No.1 is a unique example of the savoury Hoyo de Monterrey, highly aromatic and elegant. What is new is that it is being produced again for the first time since the 70's of the last century. The 350 humidors were made by Ernesto Aguilera, artisan and goldsmith and this new production joins a diversity of offers every year, as Cuban strategy to impact the international tobacco market. Habanos S.A. distributes tobacco Premium in more than 125 countries.